Take the wheel and conquer the ever-changing terrain or sit back and enjoy the exhilarating ride. 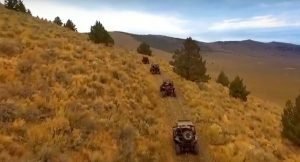 Outriders' will show you the way through the true back country of Central Oregon. Drive through winding roads and spectacular lava flows. Head up and experience advanced trails to spot the wildlife and landscape of the lava flows with spectacular geologic features. The fresh air and beauty of Central Oregon will surround you. 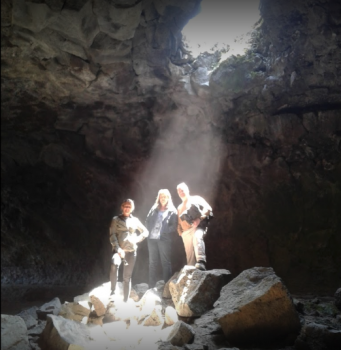 Come check out the fascinating terrain of The Deschutes National Forest! #goexplore! Full Day Tour / We Guide You Drive Tour / Meet at TH / High Desert Mountains, Fascinating Lava Caves, Ancient cinder cones, thrilling roller-coaster style riding trails, National Forests, majestic viewpoints, this tour has it all. Encounter adventure, education, fun, and create lasting memories. #goexplore! Includes: Driving Instructions, Safety Briefing, Morning Snacks, Boxed Lunch and Beverages. All guests are provided helmets and gloves for protection and safety. Keep in mind that you will be exposed to the elements. We recommend all guests to wear long pants and durable, closed toe shoes. It is a good idea to dress in layers, as climate in the high desert offers extreme temperature changes. All helmets are equipped with a pull-down visor, except children (we provide googles). If you wear contacts you may want to wear prescription lenses instead, as trails can be dusty. Full of Forests, and great ponderosa pines. The best part of this back-country tour is just enjoying all the ecosystems found in the Deschutes National Forest and The Bureau of Land Management. See it all on our longest tour!! This trail begins just outside of the town of Millican and journeys through a massive Ponderosa Pine forest to vistas and lookouts.The area is dominated by Lodgepole pine, Western juniper, and Ponderosa pine with big sagebrush, bitterbrush, mountain mahogany, rabbitbrush, and a variety of desert grasses as the main ground cover. Common grasses in this area include Idaho fescue, bunch grass, and blue bunch wheatgrass. Animals common in the forest include mule deer, pronghorn, coyotes, bobcats, cougar, and American black bear. Smaller mammals include American badgers, porcupines, golden-mantled ground squirrels, and chipmunks. Small bird species include mountain bluebirds, western meadowlarks, white-crowned sparrows, lark sparrows, and sage grouse. Larger birds include ravens, great horned owls, turkey vultures, red-tailed hawks, and golden eagles. The cave was named for H. E. Derrick, a pioneer rancher with a homestead 3 miles southeast of the cave. Because it was large and cool, early homesteaders in the Fort Rock area often used the cave as a summer recreation site. During social gatherings at the cave, families used the ice found in the cavern to make ice cream. 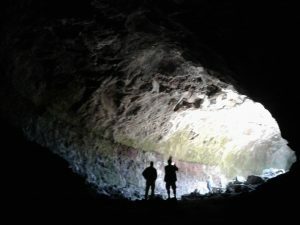 During the early days of World War II, local residents planned to use Derrick Cave as an air-raid shelter if the Japanese began bombing the west coast of the United States. While residents of Central Oregon never needed an air raid shelter during World War II, Derrick Cave was designated as a nuclear fallout shelter in 1963. Supplies of food and water for up to 1,200 people were stored at the site. The supplies were stored in a small branch of the cave behind a locked steel door. However, vandals broke into the supply vault on several occasions and plundered the food cache. The vandals left the civil defense water cans, probably because they had frozen solid. By 1970, all of the supplies had been stolen by vandals or removed by civil defense authorities. Pine Mountain Observatory (PMO) is an astronomical observatory owned and operated by University of Oregon Physics Department. It is located 26 miles (42 km) southeast of Bend, Oregon (USA) in the Deschutes National Forest on top of Pine Mountain. The site was discovered by professors Russ Donnelly and E.G. Ebbinghausen in 1965 and has been in operation since 1967. The Oregon high desert is a region of the U.S. state of Oregon located east of the Cascade Range and south of the Blue Mountains, in the central and eastern parts of the state. Divided into a southern region and a northern region, the desert covers most of five Oregon counties and averages 4,000 feet (1,200 m) above sea level. The southwest region is part of the Great Basin and the southeast is the lower Owyhee River watershed. The northern region is part of the Columbia Plateau, where higher levels of rainfall allow the largest industry on private land to be the cultivation of alfalfa and hay. Public land within the region is owned primarily by the Bureau of Land Management, which manages more than 30,000 square miles (78,000 km2) including five rivers designated as Wild and Scenic. Map 2510 Campground on your Smartphone. Just 35 minutes from Bend, head east on US-20 E for 19 miles, turn right onto Spencer Wells Rd. (NF-23) go 5.5 miles, then continue onto NF-23 for 0.3 miles, and go slight right onto NF-25 for 2.1 miles. Turn left onto Lava Bed Rd/NF-2510 and you'll see our trailhead at the staging area on the right. Tour Bookings Require 2 RZR min. See you at the Trailhead! Map 2510 Campground on your Smartphone. Just 35 minutes from Bend, head east on US-20 E for 19 miles, turn right onto Spencer Wells Rd. (NF-23) go 5.5 miles, then continue onto NF-23 for 0.3 miles, and go slight right onto NF-25 for 2.1 miles. Turn left onto Lava Bed Rd/NF-2510 and you'll see our trailhead at the staging area on the right.